Bienvenue, Halito, Welcome to Isle de Jean Charles. Isle de Jean Charles is a narrow island in the bayous of South Terrebonne Parish, Louisiana. 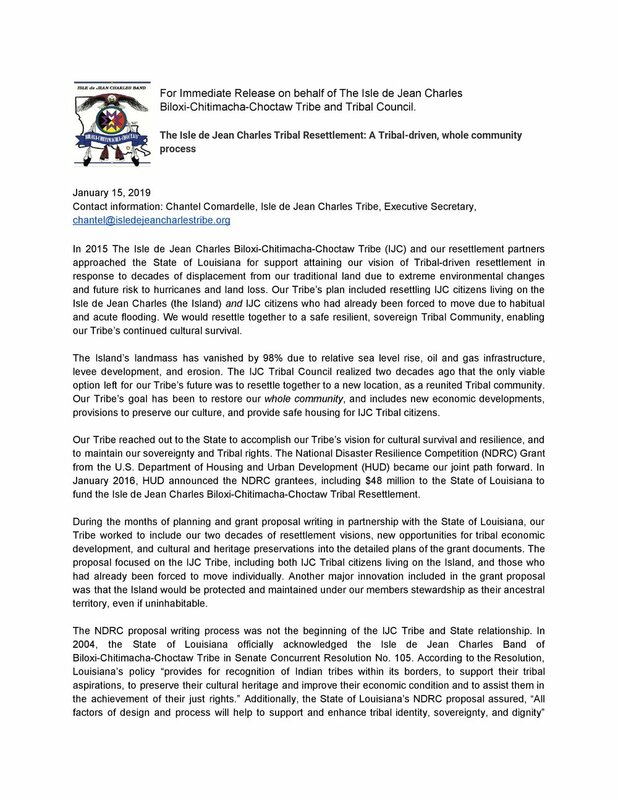 A place of immense physical beauty and great biodiversity, it is most importantly home to the Isle de Jean Charles Band of Biloxi-Chitimacha-Choctaw Tribe. For our Island people, it is more than simply a place to live. It is the epicenter of our Tribe and traditions. It is where our ancestors survived after being displaced by Indian Removal Act-era policies and where we cultivated what has become a unique part of Louisiana culture. Today, the land that has sustained us for generations is vanishing before our eyes. Our tribal lands are plagued by a host of environmental problems — coastal erosion and salt-water intrusion, caused by canals dredged through our surrounding marshland by oil and gas companies, land sinking due to a lack of soil renewal or "crevasse," because of the construction of levees that separated us from the river, and rising seas. These environmental changes have led to increasing flood risk and changes in our life ways. For example, our Island needed a levee, but the small levee that protects our Island during high tide has also led our bayou to become stagnant, killing the ecosystem we once had. The need for reliable access to jobs and services up the bayou have forced many of our people to nearby areas, including Pointe-aux-Chenes, Bourg, Montegut, Chauvin, along Bayou Grand Caillou, and Houma. For over fifteen years we have been planning a Tribal Resettlement in order to bring our people back together, rejuvenate our ways of life, and secure a future for our Tribe. Isle de Jean Charles is in Terrebonne Parish, Louisiana, situated between Bayou Terrebonne and Pointe-aux-Chene. Bayou Pointe-aux-Chene is the boundary between Terrebonne and Lafourche Parish. Before the establishment of Terrebonne parish in 1822, Terrebonne Parish was once part of Lafourche Interior Parish. The Island is split down the middle by Bayou St. Jean Charles. The growth and development of the community of Isle de Jean Charles started when Jean Marie Naquin, a Frenchman, married Pauline Verdin, a Native American. Jean Marie was disowned by his family for marrying an Indian, so he and Pauline moved to the land where Jean Marie’s father, Jean Charles Naquin (who the Island is named after), had travelled many times to service the pirate Jean Lafitte—the land which is now known as Isle de Jean Charles. All of Jean Marie and Pauline’s children, except their oldest daughter, married Indians, descendants of Biloxi-Chitimacha, and Choctaw Tribes who inhabited the area near the Island. 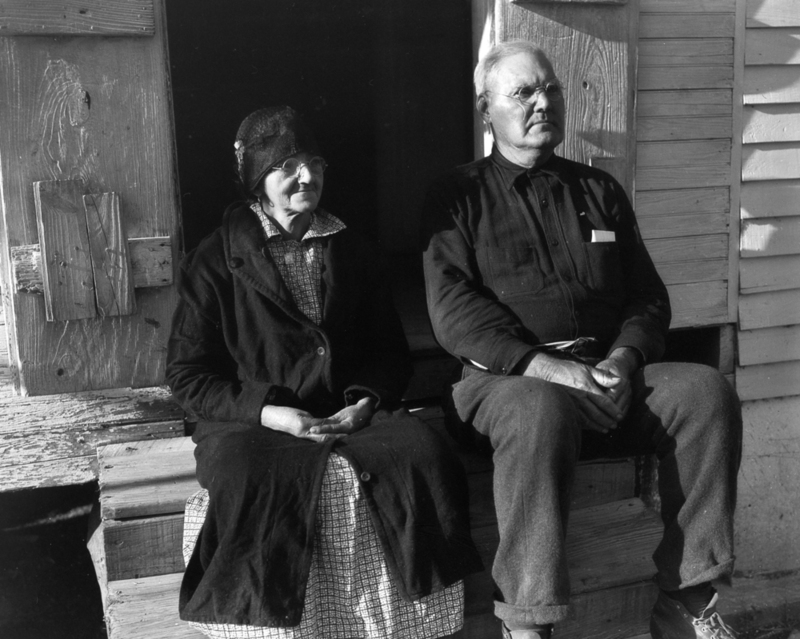 The Island’s first people were Naquin’s, and then Dardar and Chaisson families also moved on the Island as a result of intermarriage between these families. According to the Tribe's oral history, this was in the early 1800s. Isle de Jean Charles was considered “uninhabitable swamp land” until 1876, when the State of Louisiana began selling the land to private individuals. Before this time it was illegal for a Native American to purchase land. The 1880 Terrebonne Parish Census listed the first land buyers as residents and included just four families, that of Jean Baptise Narcisse Naquin, Antoine Livaudais Dardar, Marcelin Duchils Naquin, and Walker Lovell. By the census of 1910, the area was officially called “Isle á Jean Charles” and had grown to sixteen families, all descendants of the first four families; a total of 77 people. The occupations of the men were fishermen, oystermen, or trappers. Isle de Jean Charles is the only community in the surrounding area which has had designated Chiefs from historic time of settlement. The Chief ran the grocery store, was responsible for the mail, arbitrated disputes, represented the people of the island with outsiders, and gathered the residents for group work in the community. Each Chief named his successor, being the person he thought best qualified to fulfill the duties. Jean Baptiste Narcisse Naquin, born in 1841 and died after 1910, was said to be the first Chief of the Indians on Isle de Jean Charles. Although no time period was given for this appointment, one would assume he was at least of middle age, which would be around the 1880's. Jean Baptiste Narcisse Naquin passed the Chieftainship to his son, Jean Victor Naquin, before his death. Jean Victor Naquin was born in 1869 and died at the age of 86 on Isle de Jean Charles in 1956, and is buried in Holy Rosary Cemetery, Houma LA. Before his death, Victor passed the Chieftainship to his nephew, Antoine Martin Naquin who was also commissioned by Sheriff Prejean to keep law and order. Antoine was born 31 January 1896 and died at the age of 82 on 24 April 1978, buried in Bisland Cemetery at Bourg, LA. Deme Naquin was Antoine’s assistant and apprentice. He became Chief upon appointment by Antoine. Governor Edwin Edwards appointed Deme as Representative to the Bureau of Indian Affairs for the State of Louisiana. Upon his retirement in 1997 he appointed his brother, Albert Paul Naquin, the present Chief. Similar to that shown in the photo above from the Indian community at Fa La, the original dwellings on Isle de Jean Charles were built from a mixture of mud and moss (bousillage). The walls were about six inches thick, then covered on the outside with palmetto. “Dirt” floors (clay which after drying was as hard as concrete) were made higher than the ground level to keep out moisture. Floor mats were made of palmetto, and some say they were also used for sleeping. The houses had dome shaped roofs covered with palmetto. A smoke hole was left in the very center and could be closed in rainy weather. The houses were called “mud houses” and were in use up until the early 1900s. Constant repairs were needed for their upkeep. They provided little protection in hurricanes and none during flooding. In the 1930s, a missionary school was built on the mainland in Pointe-aux-Chene. The children went by pirogue to school, traveling four miles each way by paddle or push pole. The school was run by the Live Oak Baptist Church and funded by donations from Baptists in Atlanta, GA.
After a public school was built on lower Pointe-aux-Chene for Indian children, the students from the Island began going by boat to attend that school in 1952. This school went to the eighth grade. Beyond that grade level, any child wanting to continue his education had to go to Daigleville Indian High School in Houma, LA, which began in 1959 and had its first graduating class in 1962. This was the first Indian high school in the state, about 25 miles from Isle de Jean Charles and Pointe-aux-Chene. When the public schools were integrated in 1967, Indians were finally allowed to attend public schools with the other races. Before this many Tribal Member’s decided to relocate to other nearby community bayous and disguise their race so that their children could attend the white schools. Until the “Island Road” was built in 1953, the only sure method of transportation to and from the Island was by boat. Previously, there had been a wagon path along a narrow ridge going to Point Farm and Bayou Terrebonne, but it was impassable at times of high water, which came in when the wind blew from the south or southeast. In 1953, a road connecting Isle de Jean Charles to Pointe-aux-Chene was built through the marshland. For several decades, the marshland has eroded and turned into the open water, leaving the road vulnerable to erosion and flooding. Tribal elders today believe that the location of the road was not only an unwise one but the construction has added to erosion of the Island. After years of advocating that the road be repaired and built higher, the parish finally completed a $6.24 million restoration and elevation of the road in June 2011. However we were informed at this time that it would be the last time they fix the road, and now just six years after this victory, the road floods regularly during tropical storm systems, high tides, and even just on days with a strong southern wind. When the road is flooded, we worry that elders who live on the Island will be unable to get medical services they need when an ambulance is unable to pass. The Morganza to the Gulf Flood Protection System is being built to protect communities along the Louisiana, but will pass north of the Isle de Jean Charles because in 1998 the Army Corps of Engineers determined it was not cost-effective to include the island. This leaves our Tribe and our ancestral homelands more vulnerable to the encroaching Gulf waters.